The groundbreaking for the construction of a new annex on May 28 marks the opening of a new chapter in NETZSCH-Gerätebau's almost 50-year history. "Our thermoanalytical measuring instruments have an excellent reputation in professional circles and are technological leaders", explains the Head of the Business Unit, Dr. Thomas Denner. "After many successful years with continuous growth in turnover, our production capacities will soon be unable to satisfy the unyielding worldwide demand." The annex on Hainberg Street will encompass 1600 m² of floor space. "We will be able to move into the new building at the beginning of next year, which will provide us with more space for Research & Development as well as Production", adds Managing Director Dr. Jürgen Blumm. "Simultaneously, the Applications Laboratories will be expanded and a Training Center will be created, which will be equipped so as to make visits into an even more valuable customer experience." 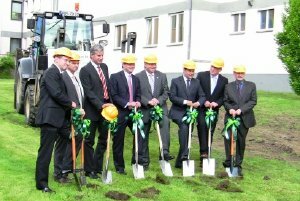 With this investment, NETZSCH will be bolstering up its Selb location, creating new jobs and making itself even more attractive as an employer.